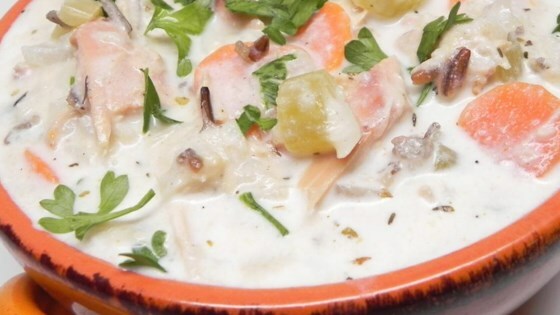 "Very delicious, very savory, robust and slightly sweet soup that warms the body and the soul. Serve with corn bread." Place the turkey legs, water, bouillon cubes, onion, celery, carrots, garlic, bay leaves, garlic powder, onion powder, black pepper, thyme, marjoram, and curry powder in a soup pot; bring to a boil. Reduce heat and simmer for 30 minutes. Stir in the wild rice. Simmer the soup at least 1 hour. Remove the turkey legs and strip the meat from the bones and tendons. Chop the meat and return it to the soup. Pour in the half-and-half and heat to just below a simmer; cook on low heat for about 30 more minutes.